In large service provider networks it is necessary to divide the routing functionality into two or more layers: a backbone layer and a gateway layer. This allows backbone routers to be focused on core routing and switching to/from other areas of the routing domain, and gateway routers may then be focused on interconnecting other service provider customers. 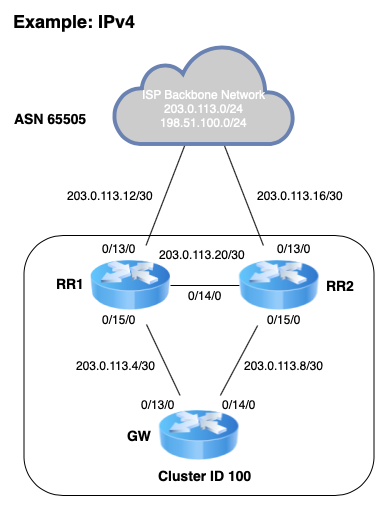 In this example, the service provider will have a fictitious autonomous system number (ASN) of 65505, Each network POP, of which only one will be detailed here, will feature 2 backbone routers which will be configured as route-reflectors. These backbone routers will be participating in BGP Cluster ID 100. Other POPs will likely be different Cluster IDs. There will also be a single gateway router which will be a client of the backbone route-reflectors. Of course, in real world scenarios there would likely be many more gateway routers, each serving a full complement of customers. rr1 tnsr(config-interface)# description "To Backbone Network"
rr1 tnsr(config-interface)# description "To RR2 Router"
rr1 tnsr(config-interface)# description "To GW router"
rr2 tnsr(config-interface)# description "To Backbone Network"
rr2 tnsr(config-interface)# description "To RR1 Router"
rr2 tnsr(config-interface)# description "To GW router"
gw tnsr(config-interface)# description "To RR1 Router"
gw tnsr(config-interface)# description "To RR2 Router"
gw tnsr(config-interface)# desc "To Customer Router"
rr1 tnsr(config-prefix-list)# description "IPv4 Routes to Import"
rr2 tnsr(config-prefix-list)# description "IPv4 Routes to Import"
rr1 tnsr(config-bgp-neighbor)# description "iBGP Sessions"
rr2 tnsr(config-bgp-neighbor)# description "iBGP Sessions"
rr1 tnsr(config-bgp-neighbor)# description "RR-Client Sessions"
rr2 tnsr(config-bgp-neighbor)# description "RR-Client Sessions"
gw tnsr(config-bgp-neighbor)# description "RR1 Session"
gw tnsr(config-bgp-neighbor)# description "RR2 Session"